Learn 3D Cad FREE online. 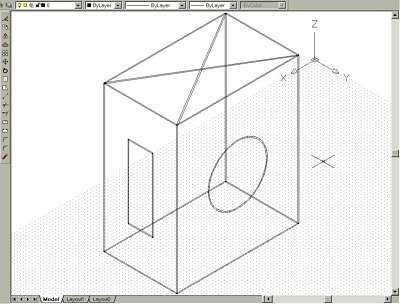 A 3D Cad online course modeling shapes on a 3D box. Task 8. The last part of the box modeling on this course to learn 3D Cad online is to create the rectangle on the left hand narrow vertical face. There are many ways to do this but the following steps give an insight to construction methods. Follow the steps. Older Autocad software does not require the 'n' modifier - move straight to the 'y' modifier on the next line. of Pick the base line of the left hand narrow face. of Pick the top line of the left hand narrow face. After creating the construction line the 'offset' command is needed. When using offset, it is good practice to use the 'end' and 'mid' modifiers for reasons discussed in the note below. Select object to offset or <exit >: Pick the construction line just created. of Pick an end point to the right of the construction line. Select object to offset or <exit >:Pick the construction line again. of Pick an end point to the left of the construction line. Now erase the central construction line. The next step is to join the mid points of the two new lines to create a large 'H' on the narrow face. of Pick one of the two new lines. of Pick the other new line. of Pick one of the vertical lines at the top. of Pick the other vertical line at the top. of Pick one of the vertical lines at the bottom. of Pick the other vertical line at the bottom. The box should now look like the one in Fig Tsk 8. Without exiting the model, save it the way you would usually save a 2D drawing. If you wish to leave AutoCAD at this point, exit in the usual way. On your return, call up the model as you would for a 2D drawing.